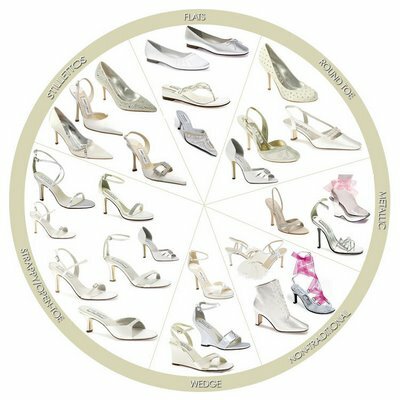 What to Look for in Wedding Shoes Just like your wedding day, you'll want your wedding shoes to be absolutely perfect. Here are a few things you might want to consider when shopping for shoes for your wedding. Comfortable Wedding Shoes The perfect wedding shoes will need to be many things, but mostly, they must be comfortable. Keep in mind, you'll be walking down the aisle, posing for photographs, greeting guests, cutting the cake, and possibly dancing in these wedding shoes. This could add up to hours and hours on your feet, so be sure, above all else, that you choose shoes that are comfortable for your feet. Heels of Wedding Shoes The heel height of your wedding shoes is of utmost importance. Your dress will be fitted to accommodate the height of your wedding shoes, and if you're not comfortable in some of the higher heeled shoes, wearing them on your wedding day might not be the best time for this idea. If you want a bit of added height, but are not comfortable in stilettos, consider platform heels, or lower kitten heels, remember the very newest look with ultimate femininity and style, ballet slippers. They could be the answer to all of your questions and needs. Fabric Choices for Wedding Shoes Silk or satin are traditionally the two most popular choices for wedding shoes, but of course, your wedding dress and personal taste should have the greatest impact on the shoes you choose. If you're wearing a non-traditional wedding dress, consider sparking up the entire look with a not so traditional shoe as well. Look at some of the new strappy/clear heels that are looking at being the hottest shoewear item this fall. Wedding Shoes to Suit Your Style While your shoes should be a good match to your dress and the setting of your wedding, they should also reflect your personal style. For example, a funky, trendy bride might consider bridal shoes with chunky heels; while a romantic at heart might love a pair of lacy white "granny boots" as her bridal shoes. Your day, your style! Trying on Wedding Shoes When shopping for wedding (or any) shoes, be sure to shop toward the end of your day. Our feet swell over the course of a day, and you'll want to try on shoes when your feet are largest. Also, if you'll be wearing hose on your wedding day, be sure to wear them when trying on your bridal shoes. Breaking in Your Wedding Shoes To be sure that on the big day your wedding shoes aren't killing your feet, you'll need to break them in. Starting a few weeks before your wedding, try wearing your bridal shoes around the house (not outside!) for a small amount of time. Over the course of the next couple of weeks, increase the amount of time you wear them. Be sure to walk and stand a lot in them, until you're certain that you can wear them comfortably for at least 4 or 5 hours. Extra Shoes for Your Wedding You may decide that for your reception, you'd like to wear a more comfortable pair of shoes. If this is the case, be sure that your second pair of shoes have the same heel height as your actual wedding shoes. This will insure that your dress doesn't drag the ground while you're dancing or socializing. Wedding Shoes and Floor Surfaces The aisle you'll be walking down may be carpeted, or you may find that the reception hall has slick floors. Either surface can be difficult to walk or dance on, especially in your wedding shoes. To add some traction to your shoes so you do not have to worry about slipping – lightly sandpaper the soles to negate worrying about it. Ultimate tip! The most important tip: comfort, comfort comfort. With the endless choices in shoe styles you do not have to compromise style to gain comfort. You can easily have it all!